So we now know what’s in the EU-UK Withdrawal Agreement. Last week the full 585 page document which will be put to Parliament in a ‘meaningful vote’ sometime before Christmas was published. If approved, it will form the basis of our future relationship with the European Union decades into the future. Now I never thought I’d write this, but Theresa May has managed the impossible: she’s united a majority of those who supported Leave and Remain in both Parliament and in the country against her plans because this 585 page document pleases virtually nobody. To those who support a UK completely divorced from the EU, it binds the country into the existing Customs Union, all EU rules and regulations, the Single Market and with European Courts’ arbitration for the foreseeable future. Likewise, to Remainers, it leaves the UK in the worst of all worlds. Yes Britain would still linked to the EU economically and, to a very large extent, legally; but with absolutely no political voice or say on any of the laws being made. To Remainers (and I heard a few Leavers – like Nadine Dorries MP – over the weekend say similar) we will have lost our political influence, our votes at the European Parliament and Council of Ministers, and, of course (in some areas of EU law-making) our national veto. “Not fully in and not remotely out”, is how it was put to me in a conversation with a very angry Tory MP in Parliament last week. And he’s right, from whichever perspective you come from. Now I’m a democrat: Denton and Reddish, as a parliamentary constituency, voted to leave by a substantial margin. It’s actually a bit more complex than that for me because the results were counted on a borough by borough basis. 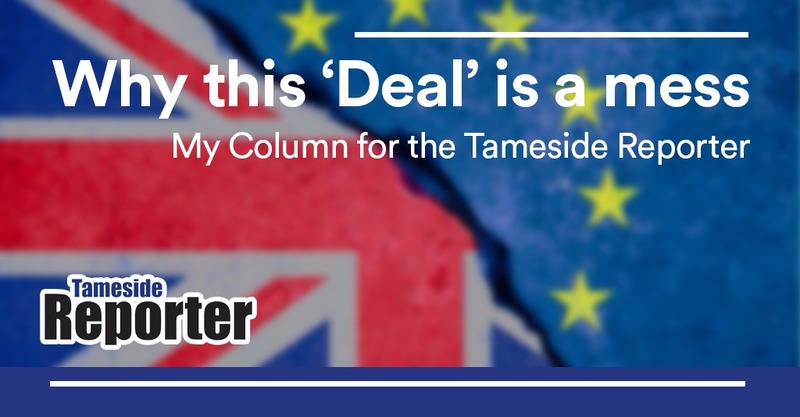 Tameside voted to leave and Stockport to remain, but I voted to trigger Article 50 in good faith to allow the Government to negotiate a new relationship. But it is the result of 18 months of Tory Government infighting that has resulted in the mess we now find ourselves in. And in all honesty, I cannot support the Withdrawal Agreement in anything like its current form. Maybe the Prime Minister will be able to secure further changes before the ‘meaningful vote’, but if she can’t, there should be a General Election, where a fresh Parliament can be elected – hopefully with the clear mandate to break the sorry impasse we now find ourselves in and with a programme to bring our country back together again after two years of bitter polarisation.